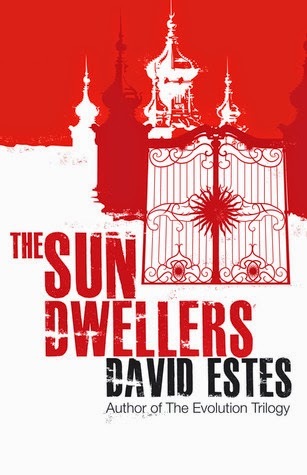 The Sun Dwellers by David Estes is the third book in The Dwellers saga. Available at Amazon. This book moved slower than I expected, for a couple of reasons. #1 - The second book in The Dwellers saga, The Star Dwellers, ended with the Tri-Realms on the brink of war. I thought I'd see more of that war in The Sun Dwellers, but the main characters are more like a special reconnaissance team that leaves the battle field to sneak behind enemy lines. We finally see the Sun Realm in all its superficial glory and, with the exception of missing soldiers off fighting, the war barely touches the people who live there. So, I was surprised by the pacing and tone of this book. In my review of The Star Dwellers, I mentioned that readers see implications of advanced technology but it's always hidden from sight (of both the readers and the main characters). A little more technology pokes out from the walls of the Sun Realm and we finally find out how it affects our main characters, Tristan and Adele. #2 - This is technically the third-book in what is a seven-part series, if you count the sister series, The Country saga, which should be read before continuing with the next book in The Dwellers saga (The Earth Dwellers). I thought I'd meet more characters while more sub-plots were braided together. Because there's still another book, way out there in the distance beyond the next saga. Instead, this book is the opposite, more like the final book in a trilogy with most of the loose ends tied off and only a few dangling threads left to be woven into this distant fourth book. Now I expect that the folks of the Country Saga will meet up with the folks of The Dweller saga in the fourth book, The Earth Dwellers, which will complete both sagas.